Keep your location to yourself; block people in Phone, Messages, and FaceTime; give Safari trackers the boot; and see a link's URL before you follow it. If you haven't upgraded your iPhone, iPad, or iPod touch to iOS 7 yet, there’s only one question: What are you waiting for? That's not to say the new version of Apple's mobile OS is perfect. 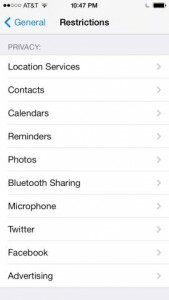 Here are four iOS 7 privacy settings you may want to review. 1. Clear and disable Frequent Locations. Some people don't mind Apple tracking their location and retaining a history of the places where they use their iOS 7 devices. The rest of us have to disable the mobile OS's Frequent Locations feature, which is enabled by default. 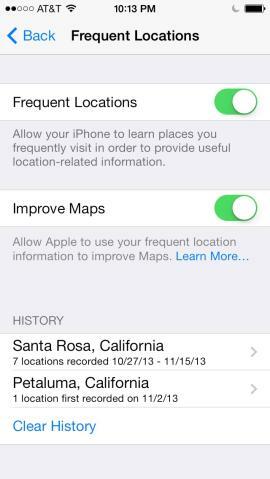 To opt out of location tracking,go to Settings > Privacy > Location Services > System Services > Frequent Locations. In addition to disabling this option, you can choose not to provide Apple with your location information "to improve Maps." Select one of the locations in History to view your frequent locations on a map. The Clear History option is at the bottom of the Frequent Locations screen. 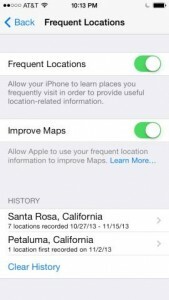 All of iOS's location services are turned on by default. You can individually disable cell-network search, compass calibration, diagnostics and usage, location-based iAds, "Popular Near Me," time zone, traffic, and Wi-Fi. You can also customize your location sharing via ‘Restrictions’. Go to Settings > General > Restrictions > Enable Restrictions. Enter your passcode twice to allow restrictions on Safari, FaceTime, Siri, iTunes Store, installing and deleting apps, and other settings. Scroll down to find the settings that restrict content by rating for music, podcasts, movies, television, books, apps, and Siri. Press the Web sites option to limit adult content and restrict specific sites. Scroll further to the Privacy section, which includes location services, contacts, calendars, reminders, photos, Bluetooth sharing, Twitter, Facebook, and advertising. Press Location Services to allow or block changes, deactivate location services globally, or disable location for specific apps. 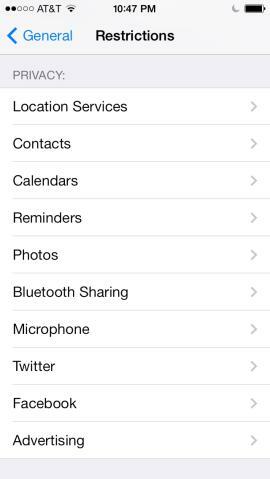 You can access System Services at the bottom of the Location Services screen. At the bottom of the System Services screen is the toggle control for showing the status bar icon next to services that request your location. Some people report that this setting is off by default, but on my iPhone, the icon appeared by default. 2. Block callers in your contacts. On the iPhone, blocking is available in the Phone, Messages, and FaceTime apps. On the iPad and iPod touch, you can block callers in Messages and FaceTime. As Apple Support states, you won't receive phone calls, messages, or FaceTime calls from the people on your block list. In the Phone and FaceTime apps, open Favorites or Recents, press the Info button to the right of the entry you want to block, scroll to the bottom, and select Block this Caller. You can also open Contacts, choose the entry, and then scroll to and select Block this Caller. To block a sender in Messages, open one of their messages, press Contact in the upper-right, press the Info button, and then scroll to and press Block this Caller. To see your list of blocked callers, select the app in Settings (Phone, Messages, or FaceTime), and select Blocked. You can add a contact to the list by pressing Add New and then selecting the contact. To unblock a contact, press Edit in the top-right corner and then choose the entry. 3. Enable Do Not Track, and block cookies in Safari. 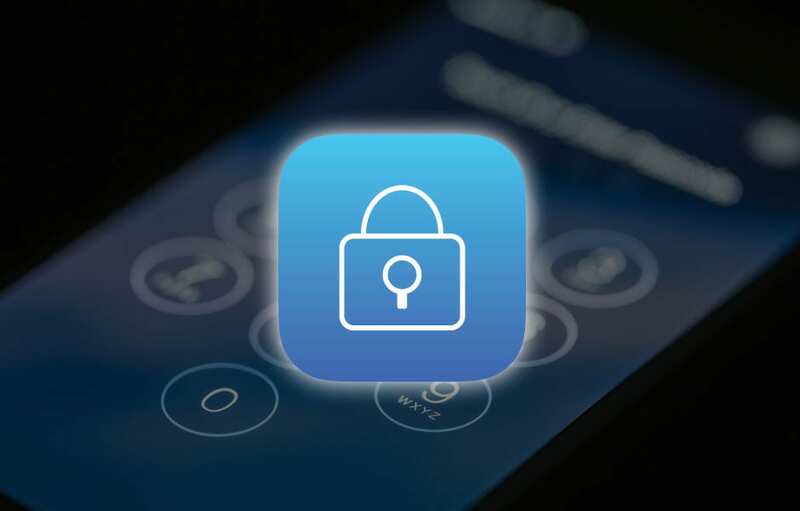 The Do Not Track feature in iOS 7's built-in browser relies on the voluntary cooperation of trackers, so its effectiveness is suspect. Still, every little bit helps. 4. View a link's URL before you click. Press and hold a link to open a half-window that shows the link's URL and four options: Open, Open in New Page, Add to Reading List, Copy.